We raised 60,995 pounds! Thank you! The final numbers are in, and we are thrilled to announce that this year, we raised a total of 60,995 pounds of food for The Daily Bread Food Bank! We exceeded our target of 24,000 pounds by over 150%! An amazing result that couldn’t have happened without the involvement of so many people. We would like to take this opportunity to thank all those that have been involved in Sarah’s 6th Annual Food Drive. Many thanks to all of the students, teachers, daycares, administrators and families who took part in the Battle of Bayview School Challenge. Thanks to all of our neighbours and friends who dropped off food at our home or at Tremblett’s Valu-Mart or made a donation online. Thanks to our corporate friends; Kraft Canada, Neal Brothers Foods and Nutshell Live Life Well for their extremely generous donations. Thanks to Premier Kathleen Wynne for her support of the campaign and of the School Challenge. Thanks to all those who bought Thanksgiving holiday hampers, all of which have been distributed to 160 GTA families in need, who had a wonderful Thanksgiving meal because of your generosity. 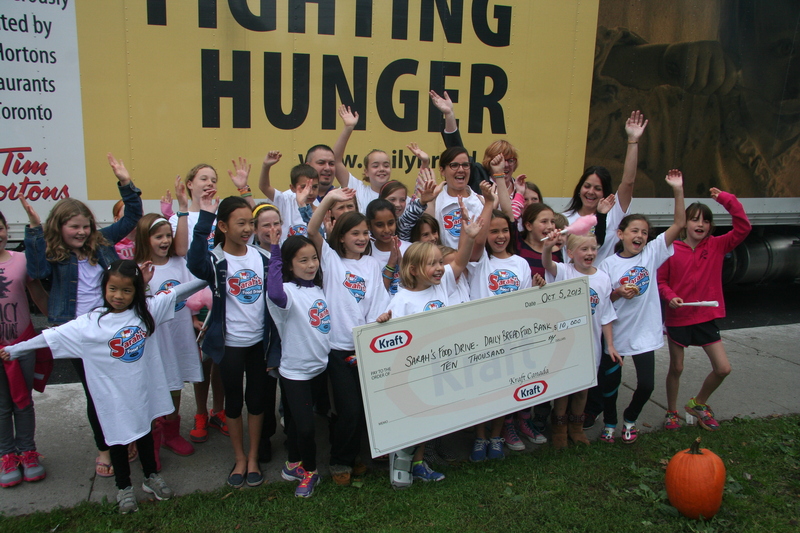 Many thanks to Tremblett’s Valu-Mart and their entire staff, who, along with Patrick Rocca of Bosley Real Estate, hosted an amazing BBQ celebration for all of the students involved in the food drive. Thanks to Jon Burnside, The Toronto Police and Toronto Fire Departments and to Academic Ads for their support during the community BBQ. Thanks to Davidson’s Valu-Mart, our newest community drop-off location. Thanks to Jen Ego and Pawsitively Pets for their support and promotion of this year’s campaign. Thanks to so many of you for sharing your individual stories about how the food drive has impacted your home. Thanks to our friends at The Daily Bread Food Bank for their help and support. And last but not least, thanks to Rob and Jessi Tremblett for their amazing community support for the food drive. We are so lucky to have you as partners and to have your business in our neighbourhood. Time to reflect on what we as a community have achieved this year.